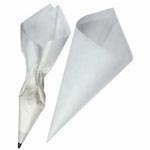 Authentic parchment paper is the professionals choice for convenience and quick bag preparation. Make use-and-toss decorating bags ideal for small amounts of icing or brush striping. Excellent wet strength for candy or a variety of icings.